is an odorless gas by produce of fossil fuel combustion. In other words when gas or oil is used to heat a home the flue pipe takes the carbon monoxide out of the house through the flue pipe. When a heating system works properly there is no CO in the air in the house, if you are sleepy all the time the heating is on, have headaches at home that go away when you leave the house or feel nauseous in the house you may have a carbon monoxide issue. 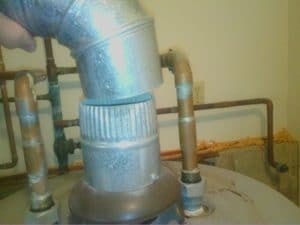 The reasons could be that there is a cracked heat exchanger in your furnace, a birds nest or holes in the flue pipe, mal-functioning gas logs or stove. Our test is done using an electronic Carbon Monoxide detector to take readings from different locations over a period of time.